We're taking a short family vacation between now and the 4th of July; the first stop is Traverse City for two nights. It's hard to believe but it's already been eight years since we last flew there! Our friends Rob, Abby and their daughter Charlotte are joining me, Gina, and Mariella up there. 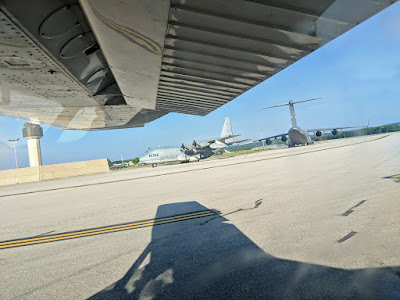 As it was disgustingly hot and humid in Dayton this afternoon, I went down a few hours before we departed to get the plane mostly packed up. That way, I was able to cool off, shower, and spend less time sweating before takeoff. After finishing things up at home, we headed over to Wright Brothers about 4:30. I had already given the plane a look-over but still did a full preflight while Gina got Mariella loaded in the back. All looked good so we pulled the plane out of the hangar, parked the car inside, and closed everything back up. Then I fired up the engine and, after a short taxi and the final pre-takeoff checks, we were airborne off Runway 20 by 4:55. After circling back around the airport to head north, I contacted Columbus Approach for flight following as we climbed. They turned me east to stay clear of their departures but within a couple minutes they'd cleared me back on course to TVC. I trimmed everything out, dialed the prop back to about 2150 RPM, leaned the mixture, and engaged the autopilot. Winds aloft were forecast to be an increasingly strong headwind as we climbed across our entire route so, despite the heat, I elected to level at 4,500 feet. We ended up averaging just over 150 knots across the ground for the entire cruise portion of flight. 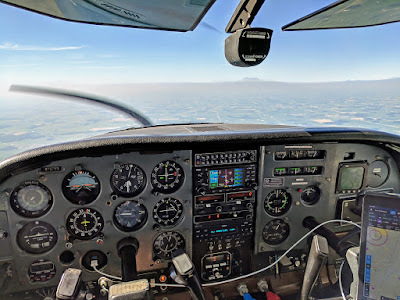 It was pretty hazy at times given the extreme heat and humidity but the temperature in the cabin actually wasn't too bad. 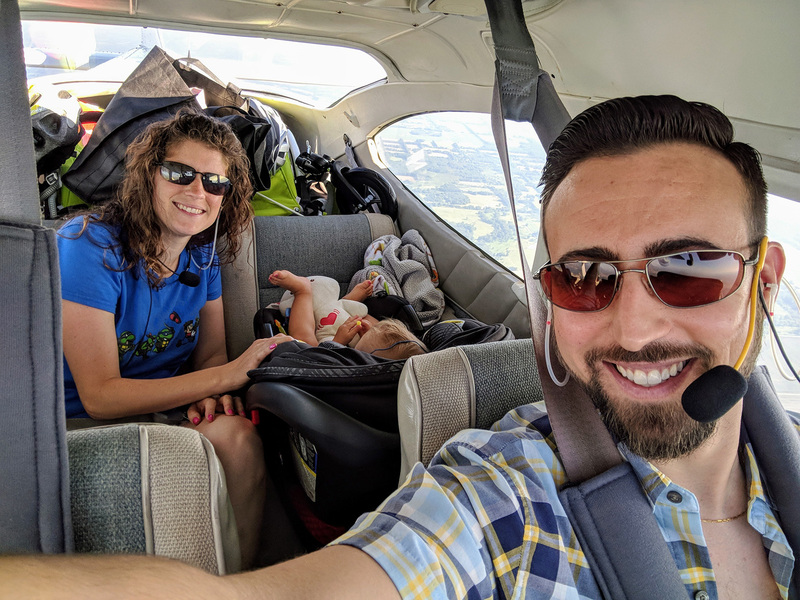 The majority of the flight really wasn't noteworthy. The haze obscured some of the beautiful longer-range views you sometimes see of Detroit and the Great Lakes in the middle of Michigan. We were handed off from Columbus Approach to Toledo to Kalamazoo to Lansing to Grand Rapids and then finally to Minneapolis Center. Well, there was one thing enroute. Northeast of Grand Rapids I spotted traffic on Foreflight that was effectively at our altitude, opposite direction. Closing but still at least 5 miles away I was monitoring when the controller came over the radio and called out the same traffic. I absolutely could not spot it and told the controller I was turning right for avoidance. It wasn't until they were less than 1/2 mile away that I spotted them, at exactly the same altitude. That's one thing I don't love about VFR cruising altitudes - on certain headings (we were heading about 358 and I bet they were headed about 185) you can technically both be at the correct altitude and still on a near-collision course. Anyway, once clear, we turned back direct TVC. Mariella didn't do as well on this flight as she has in the past. She really doesn't enjoy being restrained (she's always on the move now that she's walking super well) so being cramped in the plane isn't ideal. And then she loves to rip her earplugs out so the constant battle to keep them in certainly doesn't improve her mood. 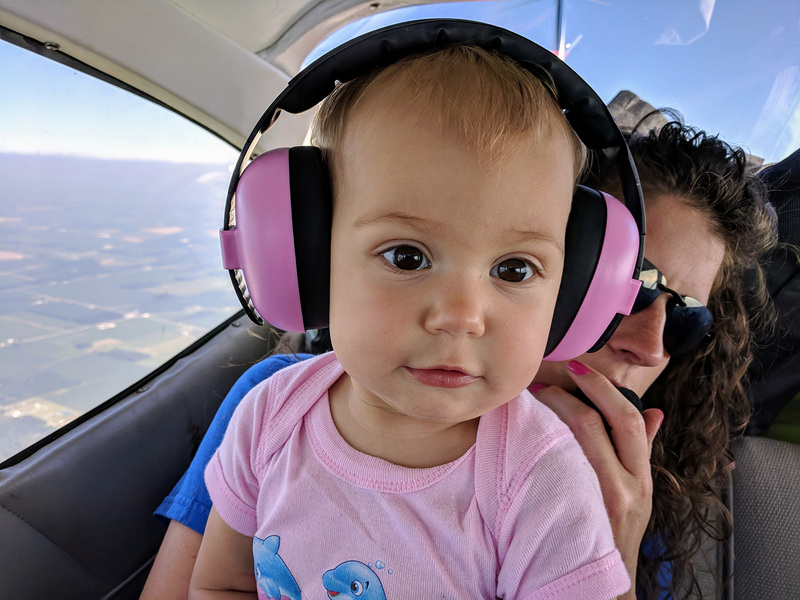 Gina gets all the credit for sitting in back and taking care of her whenever we're airborne! 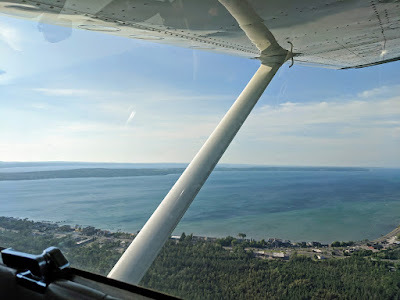 As we got within 75 miles of Traverse City the local weather reports (I'd been tuning in AWOS as we flew) were indicating some pretty serious winds. ADS-B confirmed the same, noting winds out of the south gusting over 20 knots at TVC. Normally that'd be no issue; we'd just land on Runway 18. But I already knew that wasn't an option - it was NOTAMed closed due to the Blue Angels being there for the airshow, though they weren't using it and there was nothing on it, so not quite sure why. By the time we were close enough to tune in the ATIS nothing had changed. Winds were basically a direct crosswind at 10 knots gusting to 28, with 10 knots of windshear reported by a CRJ on short final for added fun. At this point, I was honestly thinking we very well may have to land somewhere else. Minneapolis Center cut us loose and I called the tower around 10 miles out. They immediately cleared us to land entering on a left base for Runway 28 and again noted the winds and windshear report. I guess not too many folks were up flying today just for the fun of it! My plan was this - only use 10 degrees of flaps, fly about 10 knots faster than normal, and fly a slightly longer final to see if I could hold the plane on the extended runway centerline. 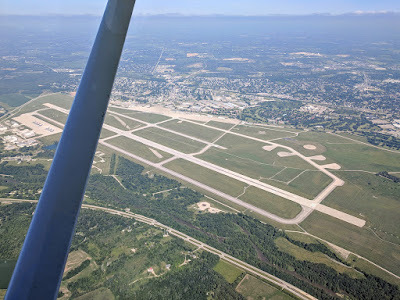 Runway 28 is 7,000 feet so I plenty of concrete to work with. If I could do all that, then we'd attempt to land. Otherwise we'd be going around and possibly diverting. Well, long story short, we made it in. 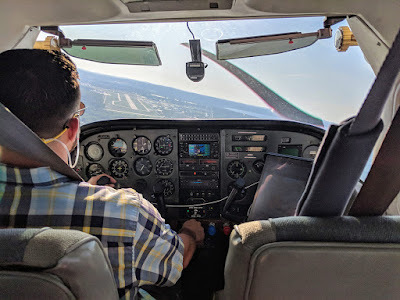 I sort of wish I had video of me on the controls because this was perhaps the best example I've yet encountered in all my flying of "you fly the plane, you don't let it fly you." I'm sure I had the yoke and rudder dancing all over the place but in the end I managed a respectable crosswind landing, touching the left main first and preventing the nose from coming down too hard in the seriously gusty winds. 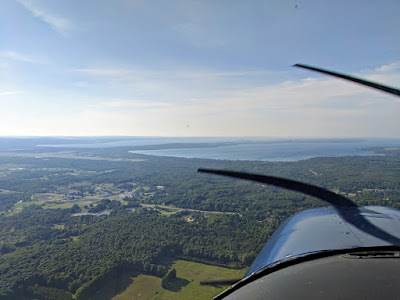 We did encounter the same shear on final - I saw the airspeed instantly drop from about 75 to 65 and then come back up again - so I let the tower know. A "follow me" golf cart pulled out as we taxied onto AvFlight's ramp and guided us to a tiedown. Then the line guy tied the plane down and brought our rental car over. That sort of service is truly one of the joys of small airplane flying! It took a little while to haul all our gear out of the plane. 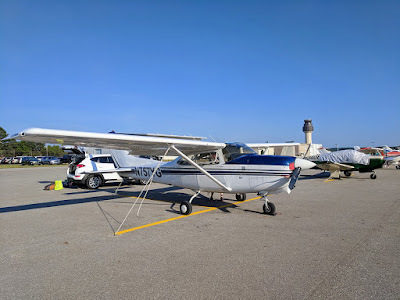 When that was finished and I made sure the airplane was totally secured, we headed into the FBO for a short cooldown and some tasty free ice cream. Now we're up here for a couple days with the kids and to see the airshow. It's beautiful in this part of Michigan; I really think most folks who didn't grow up nearby have no idea about the region's natural beauty. If the weather holds, we'll be heading across the state on Sunday to continue the summer getaway. Thanks for sharing this Steve, really nice article. I absolutely love reading people's stories about flying.